With yesterday's calling of the election, the Rudd Government has now moved into caretaker mode. So there will be no more hastily drawn up memoranda of understanding with indigent Pacific nation states happy at a price to resettle genuine refugees who have set out for Australia from Indonesia by boat since 19 July 2013. Both sides of politics want to stop the boats, and they are now prepared to do almost anything (except embrace the other's policy positions) to try to arrest the people smuggler trade and the tragic deaths at sea. Whoever wins government on 7 September 2013 will need to bring the PNG and Nauru deals back to Parliament even if the High Court does not get to them first. By presenting the designation and accompanying documents in accordance with the legislation, we are providing the parliament with the opportunity to be satisfied that they are appropriate. Again, I call on both houses of parliament to approve this designation, to enable the first transfers of offshore entry persons to Nauru and to provide the circuit-breaker to irregular maritime arrivals called for by the (Houston) expert panel's report. The memorandum of understanding (MOU) tabled by Bowen provided: 'The Commonwealth of Australia will make all efforts to ensure that all persons entering Nauru under this MOU will depart within as short a time as is reasonably necessary for the implementation of this MOU.' 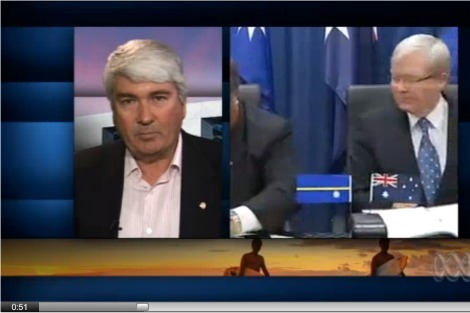 The Parliament didn't disallow the designation of Nauru as a 'regional processing country' in September 2012 but that was because all parliamentarians including Bowen thought the proposal was that Nauru be a temporary processing country, not a permanent resettlement country. On Saturday Prime Minister Kevin Rudd appearing with Baron Waqa, the President of Nauru, said, 'Today we are pleased to announce that we've reached a new regional resettlement arrangement, one that supersedes the memorandum of understanding we signed last year.' Rudd was conceding that this new arrangement bears no resemblance to the one presented to Parliament last September. The requirement to table such documents in Parliament was legislated when the Parliament decided it wanted to exclude the High Court from scrutinising future arrangements like the Malaysia Solution. The substitute was that the Parliament itself would have the chance to disallow any arrangement entered into by the Minister for Immigration acting in what he considered to be the national interest. On the eve of calling the election, he has attempted to do this spared all scrutiny by the High Court and the Parliament. The Rudd Cabinet has purported to be completely immune from all supervision by the other arms of government when deciding to ship asylum seekers, including genuine refugees, across the Pacific Ocean to very precarious futures. On Saturday, Tony Burke, the Minister for Immigration, conceded that Nauru was no place to be sending fit young adult male asylum seekers because the locals are very upset by the recent destruction of the processing centre by other fit young adult male asylum seekers. So we will send kids instead! Since 19 July, the Rudd Government has been committed to a campaign of shock and awe trying to stop the boats. Like nuclear deterrence, such a campaign might be ethically justified provided the homework has been done to ensure that the threat has maximum effect reducing as far as possible the risk of having to do immoral damage to people. The necessary advertising and messaging is yet to be rolled out in Indonesia. It should have commenced before or when the threat was issued. This government blunder has resulted not in stopping the boats but in 1765 people still boarding boats and now being condemned to immoral damage. Neither have the detailed arrangements been put in place to ensure appropriate accommodation, processing and resettlement in PNG and Nauru. Julia Gillard's Malaysia deal took months to negotiate. In the medium term, the boats can be stopped only through a negotiated regional agreement, with Indonesia and Malaysia at the table. Like many Australians, I had hoped that the dastardly plan announced on 19 July would stop the boats in the short term, as a stop-gap measure. It is dismaying to learn that appropriate consultations had not occurred with Indonesia, with the result that the very people who were to receive the shock and awe message are yet to receive it. It is also dismaying to learn that the detailed negotiations demanded by the Houston Expert panel were not concluded with PNG and Nauru before bold press announcements made chiefly for local electoral consumption. There's only one thing worse than shock and awe; that's shock and awe that doesn't work because you haven't done your homework. Prime Minister Rudd or Prime Minister Abbott will spend a lot of time in the next year cleaning up the mess and attending to the legitimate claims of the 1765 and more people to whom we forgot to send the shock and awe message of doubtful legality before implementing its dreadful consequences. Fr Frank Brennan SJ is professor of law at Australian Catholic University, and adjunct professor at the College of Law and the National Centre for Indigenous Studies, Australian National University. This article originally appeared in The Drum. You mean to say that Kevin Rudd makes policy on the run without consulting stakeholders? Well, knock me down with a feather! Once again, thank you to Fr Brennan for his clarity, and his historical and moral perspective. I’d simply add that, based on several years living in Nauru some time ago, I find it implausible that the people or Parliament of Nauru would offer long term settlement to unknown outsiders – this would be contrary to historical practice, their immigration law, their cultural attachment to land etc, and to their physical and economic situation. Things might have changed, but I doubt it. The impression I get is that political announcements about asylum seekers are being made in Australia with the sole purpose of giving voters the impression that people will no longer arrive in Australia by boat, and with little regard to the accuracy of what is said or to whether the proposals that are outlined are either moral or feasible. As we tend to get the Government we deserve, it is up to all Australians to let their representatives and candidates know that we value veracity, and concern for those in need. We must also demand of them that they work to build a political consensus, which would seem to be a precondition for effective regional agreements with Indonesia etc. It is not a people smuggling trade, asylum seekers and refugees have the right to pay whoever they can or choose to so they can be safe. Today in Australia Raoul Wallenberg and Boenhoffer would be arrested and called evil and ugly. In Walenberg's case the arrest of the first person would have resulted in the deaths of 100,000 people. Australia is the one trading people, no-one else. We are trying to pretend we have the right to colonise the Pacific while ignoring our laws. And sorry Dennis we have a dirty deal with Indonesia already. We pay for them to jail,and deport refugees and then lock up and demonise those who escape. This exchange on Q&A last night (including Doug Cameron’s slip of the tongue) marks a turning point in our nation’s political history in dealing with asylum issues: DOUG CAMERON: Yeah. Look, I think that the government has and Prime Minister Howard - Prime Minister Rudd has indicated - well, I’ll go back to Howard because ... GREG HUNT: Gillard? DOUG CAMERON: No, because - you know, John Howard was operating in a completely different atmosphere, a completely different situation. GREG HUNT: He created that situation. DOUG CAMERON: Things change. He didn't create that situation. The situation... GREG HUNT: He created and defined the circumstances. TONY JONES: Hold on a sec. We’ve got to let him answer. DOUG CAMERON: The situation at the time was conducive to making sure boats stop. That's the international situation. It is changed. You have got international people smugglers. They are all over the world now putting people through in Australia and that's the big problem and we’ve got to try and deal with it.. TONY JONES: All right, Grahame, briefly. GRAHAME MORRIS: I used to think that Doug was roughly where the heart and soul of the Labor Party was but what he just said is essentially what John Howard would say and you wonder where is the heart and the soul of the Labor Party now? http://www.abc.net.au/news/2013-08-06/an-solomons-asylum/4868288 At least the Solomon's told Carr to get lost with his human trading dirty deals. The execution of the government's bright ideas seems to be done by the same kind of people brilliantly parodied in the ABC's "The Hollow Men". It's quite terrifying that our elected representatives, or their Departments, aren't allowed to do better than that. I don't know under what law you think anyone can stop anyone from sailing to any place they want to.